Not to be confused with Jingzhou. For other uses, see Jinzhou (disambiguation). Jinzhou (/ˈdʒɪnˈdʒoʊ/, simplified Chinese: 锦州; traditional Chinese: 錦州; pinyin: Jǐnzhōu) is a prefecture-level city of Liaoning province, People's Republic of China. It is a geographically strategic city located in the "Liaoxi Corridor" (辽西走廊), which connects land transportation between North China and Northeast China. Jinzhou is China's northernmost seaport and the coastal economic center of West Liaoning on the north-western shore of the Bohai Sea. The total area under the jurisdiction of Jinzhou is 10,111 square kilometres (3,904 sq mi), most of which is rural, encompassing a coastline of 97.7 km (60.7 mi). It is one of the biggest cities in Liaoning with a population of 3,126,463 at the 2010 census, of whom 1,091,799 reside in the built-up area made of 3 urban districts. Jinzhou is an ancient city with over a thousand years of history. Originally known as Tuhe (徒河), it was part of Yan in the Warring States period. Under the Qin dynasty, the majority of what is now Jinzhou became part of Liaodong township. It was part of Changli township in Youzhou during the Han dynasty and Three Kingdoms periods, but fell under the jurisdiction of Yingzhou in the Beiwei, Dongwei, and Beiqi periods, before becoming part of Liucheng township and then Yan township during the Sui Dynasty and Tang dynasty. During the Tang, it was the seat of the Andong township. The name "Jinzhou" came into use in the Liao dynasty, when it belonged to Zhongjing prefecture. In the Jin dynasty, it was part of Dongjing Township and Beijing township. It belonged to Liaoyang Xingzhongshu in the Mongol Empire/Yuan dynasty and to Liaodong township in the Ming dynasty. It was ruled by Tianfu during the Qing dynasty, when its name was changed from Jinzhou to Jinxian. It was previously known in English as Chinhsien and Chinchow. During the Republican period, Jinzhou was attached to Liaoning Province. 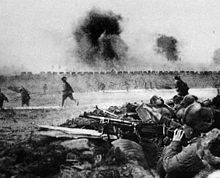 When the Chinese Civil War resumed in 1945, Jinzhou was the site of a major battle between the Communist and Nationalist forces, since it is where the main route from Manchuria through Shanhai Pass enters central China. Its capture on November 22, 1945 by Nationalist forces under Du Yuming forced the Communists to agree to a temporary ceasefire that lasted several months. After the establishment of the People's Republic of China in 1949, Liaoxi Province was founded and Jinzhou became its provincial capital. 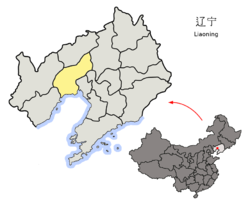 Jinzhou came back under the administration of Liaoning Province in 1954, when Liaoxi and Liaodong provinces re-merged. Jinzhou is located in the southwestern portion of Liaoning, and borders Panjin, Anshan, and Shenyang to the east, and Huludao on the west. The city's southern coast is the Liaodong Bay. On the north are Chaoyang and Fuxin. Jinzhou has a monsoon-influenced humid continental climate (Köppen Dwa), with four distinct seasons; winters are cold but very dry while summers are hot and humid. The monthly 24-hour average temperature ranges from −7.9 °C (17.8 °F) to 24.3 °C (75.7 °F) in July, with the annual mean being 9.50 °C (49.1 °F). The annual average precipitation is between 540 and 640 millimetres (21 and 25 in), a majority of which usually occurs in July and August alone. With monthly percent possible sunshine ranging from 45% in July to 68% in three months, the city receives 2,682 hours of bright sunshine annually, with autumn and winter being especially sunny. Fossil-bearing rocks are exposed in the city's vicinity, including the Yixian Formation. A genus of Early Cretaceous birds has been named Jinzhouornis in honor of the locality, but it appears to be a junior synonym of Confuciusornis which was found in the same formation some years earlier. 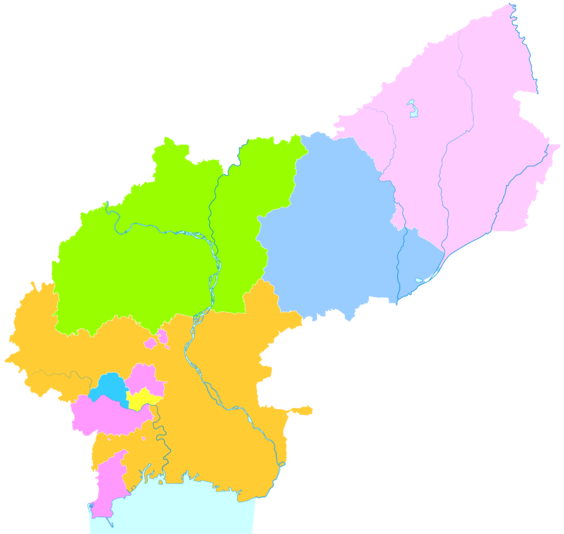 The above eight are subdivided into 43 towns, 69 townships, and 1680 villages. Jinzhou has a wide range of industries. Major traditional industries include petrochemistry, metallurgy, textiles, pharmacy and building materials. Jinzhou Economic and Technical Development Zone : The Jinzhou Economic and Technical Development Zone was established in 1992. It is among the first province-level development zones approved by Liaoning Province. The development zone enjoys convenient transportation with easy access to Jinzhou Seaport, Jinzhou airport and several state highways. Shopping and Services : Within the city, some western franchises have set up shop, most notably KFC, which has a long established foothold in Chinese markets. RT-Mart, New-Mart and Do-Do Express are major food and sundries retailers. Bank of Jinzhou (Jinzhou Yinhang) is the only bank in Jinzhou upon this writing with native English speaking staff, while Western Union, Bank of China and many other banking service are also present in the city. Visa and MasterCard are not accepted in Jinzhou, aside from a few large bank branches with access to these networks. Photograph of a shopping mall in Jinzhou city. Jinzhou Airport provides air transport to major airports in China. There are two railway stations in the city, one designated for long trips and one for shorter routes. The most popular way to get around Jinzhou is on foot or by bicycle. Taxis crowd the streets and start at 6 RMB per trip. Bus routes also blanket the city and provide the most economical means of transportation, but are not always reliable. Jinzhou is headquarters of the 40th Group Army of the People's Liberation Army, one of the three group armies that comprise the Shenyang Military Region responsible for defending China's northeastern borders with Russia and North Korea. The Liaoshen Campaign Memorial (辽沈战役纪念馆) commemorates the Liaoshen Campaign of 1948. It is a large museum that holds and displays over 16,000 pieces of equipment used during the campaign, including rifles, machine guns, mortars, cannons, and tanks. It also holds thousands of pictures and documents. The best known exhibit inside the museum is the Panoramic Picture Hall, which reproduces the complete Battle of Jinzhou on a rotating circular screen. Yiwulü Mountain is located in the west of Beizhen City of Jinzhou. It is one of the three sacred mountains in Northeast China. Wanghai Mountain is the main peak, with a height of 867 meters above the sea level, and tourist spots such as Beizhen Temple, Shenshui Bridge, Fish Pool, Guanyin Pavilion, Sijiao Pavilion, Kuangguang Pavilion, Lotus Stone, Cloud Pass and Wanghai Temple are scattered throughout the mountain range. Mount Bijia is an island in the Bohai Sea south of Jinzhou on which is located a Buddhist temple. During most of the day, Mount Bijia can only be accessed by boat, but when the tide wanes, a natural causeway connects Mount Bijia to the mainland. People can walk to Mount Bijia from the seafront on foot and local people have named this natural wonder Tian Qiao, (lit: Sky Bridge). On the top of the mountain there is a tall stone pavilion, which resembles a gigantic pen resting on a pen holder, hence the name "Bijiashan", meaning the "Pen Holder Mountain". Photograph of Mount Bijia at high tide. 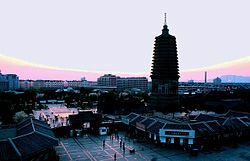 Guangji Pagoda (广济寺塔): The Guangji Pagoda is located in Guta Park situated at the heart of Jinzhou. The 72 metre tower is beautiful Liao style architecture, with thirteen levels in an octagonal shape. A quiet temple beneath completes the ancient Chinese setting. Visitors will see locals gather for early morning rituals, exercise and various other activities. There is no fee for admission to the temple grounds. The statue of Yelü Chucai, an ancient Chinese philosopher, located in the southeast corner of Guta Park. One of the best selling non-fiction novels during the 1990s, "Wild Swans:Three Daughters of China", provides some detailed descriptions of Jinzhou before and after the "1949 Liberation of China". Wang Lijun, municipal police chief. His dependability became known to Bo Xilai during his stint as Liaoning governor from 2000 to 2004. When Bo was promoted to Party Secretary of Chongqing in 2008 and found the huge corruption-pyramid fostered under Wang Yang (whose secretaryship had been moved to Guangdong), he called on Wang Lijun to take over this new municipal police force and use what he could of it to execute a crackdown, which led to the 2009 Chongqing Triad scandal. 2010 Nobel Peace Prize Winner Liu Xiaobo was incarcerated at a prison in Jinzhou, although he is originally from Changchun, Jilin. Chinese fashion designer Momo Wang was born and raised in Jinzhou. ^ "Jinzhou pronunciation". Dictionary.com. Retrieved 25 April 2015. ^ Chan, Minnie; "Chongqing Party boss defends his crackdown", South China Morning Post, 2009 Oct 18 The Xia's made famous by the publication of the book, Wild Swans by Jung Chang. Wikimedia Commons has media related to Jinzhou.